One for the fitness minded? Moto 360 2 has allegedly leaked again but this time, the photos show off a gadget fit for the active crowd. This iteration of the new Moto 360 looks like it could be water resistant and rugged with what looks like some sort of rubber encasing the watch body and a strap made of the same material. 9to5google notes it could be polyurethane. If so, then Motorola will have surpassed the Apple Watch Sport which can only handle splashes of water. 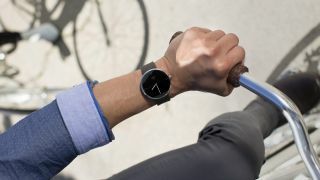 The same leaker noted that the Moto 360 Sport will launch in November - quite a bit after the standard model will supposedly be announced during IFA 2015. The second-gen wrist-ware has been leaked previously but looks more like the classic Moto 360 we're accustomed to. Launching a sports version of the 360 could place Moto in a very good spot to take the number one wearables crown.